The first ever Festival of Oriental Ethnic Music and Dance captured an authentic Mizrahi spirit and joie de vivre in Tel Aviv earlier this week. The Festival was part of a series of events planned in Israel for the 30 November commemoration of the exodus of Jewish refugees from Arab countries and Iran. For the first time ever, all the organisations of Jews from Arab and Muslim countries in Israel gathered to put on a Festival of Music and Folk Dance under the umbrella of the Coalition they established in Tel Aviv a few years ago. The festival featured dances from their respective Arab countries of birth such as Lebanon, Egypt, Yemen, Tunisia, Algeria, Libya, Morocco, and Muslim countries like Iran, Afghanistan and Kurdistan. The Festival, presided by Levana Zamir, head of the Coalition, and attended by some 300 members, took place in the great Wizo Ballroom in Tel Aviv, under the auspices of the Ben-Zvi Institute for Mizrahi Studies founded in 1947 in Jerusalem, and its new President Professor Ofra Tirosh-Baker from the Hebrew University. The festival was one of the Coalition's commemorative events for 30 November. These will culminate on 27 December 2018 with an academic conference at Tel Aviv University, titled "Light and Shadow in the absorption of the Great Aliya of Jews from Arab Countries – 70 years on". It will be the first time that this topic will be explored in an academic setting by a joint initiative of academics and members of the Coalition of organisations representing Jews from Arab countries. Levana Zamir ( left) and Prof. Ofra Tirosh-Baker ( right) presenting the Coalition's Ot-Kavod to Dr. Stanley Urman. Prof. Tirosh-Baker, is the first woman to head the Ben-Zvi Institute, founded in 1947 in Jerusalem. 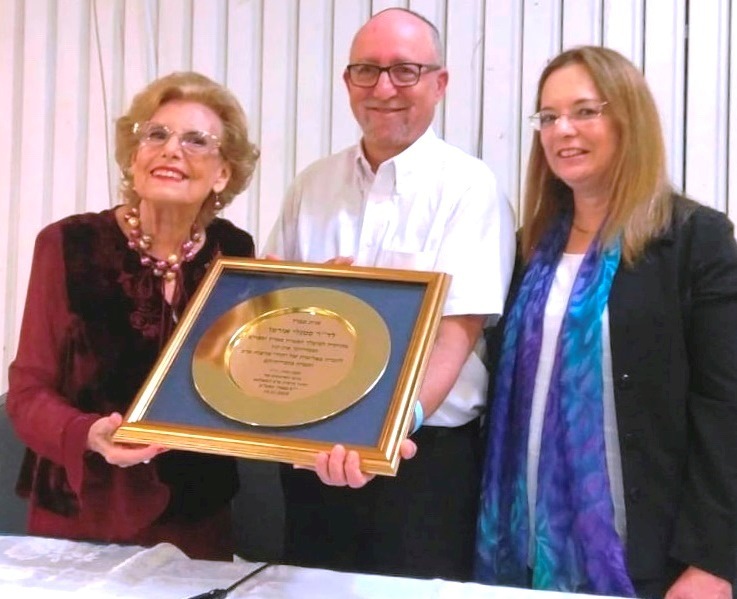 Launching the Festival, the "Ot Kavod" (the Coalition's badge of honor) for 2018 was given this year to Dr. Stanley Urman, co-founder and Vice President of Justice for Jews from Arab Countries, for his long and devoted dedication and work to the cause in Israel and all over the world, leading to the US Congress Resolution in 2008 affirming the rights of Jewish Refugees from Arab Countries. Israel's recognition followed, with a first law passed in the Knesset in 2010, and a second law in 2014. Mr. Edwin Shuker, a former JJAC President, came especially from London to attend this special and moving ceremony. There followed an academic panel discussion on Jewish stars in music and dance in Arab countries, featuring outstanding artists such as Layla Murad, Daoud Hosni, Elias Mohaddeb, Ya'acoub Sanua and others ( Egypt), Sheikh Raymond (murdered in 1961 in Algeria) and the Philharmonic Mallouf Orchestra (Tunisia), to name but a few. After a rich buffet supper boasting the best of Mizrahi delicacies - koubeh, kebab, baba ghanoush and other salads with Iraqi laffa and pita, ma'amoul, ka'ak, kourabieh, etc.. the second half featured brilliant dancing by groups of 20 professionals on stage, wearing original and colourful dress from their respective countries. They performed Yemenite and Kurdish folk dances and ethnic songs in all dialects of Arabic. The audience took to the floor when the Egyptian songs were played. The evening closed with a joyful Horah from the Fifties.